Join Scott MacIntyre and Sauter Pianos for an intimate concert at Winter NAMM 2013. 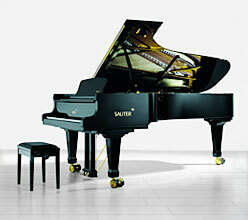 Scott will be showcasing the rich sonic and asthetic qualities of Sauter Pianos which have defined the brand since 1819. It’s a great opportunity to hear Scott perform, up close and personal, while experiencing first hand one of the world’s premiere piano makers. The concert will take place on January 24th at 2:00pm in Lounge 88. Scott will be available for photos following the concert.